If there are two things most South Africans love, it’s a braai, and cheese. The two came together in drool-worthy style on Instagram feeds across the country as foodie celebs got creative with the LANCEWOOD® Emoji Meals Challenge. The challenge was set by LANCEWOOD®, the number one cream cheese brand in SA*, in celebration of their season-long support of theUltimate Braai Master. Vying for the title of Challenge champion were famous foodies Lorna Maseko (Top Billing and The Hostesspresenter), Sam Linsell (food stylist, photographer and owner of the Drizzle and Dip blog), Kamini Pather (Master Chef SA winner 2013 and host of Girl Eats World) and Lucia Mthiyane (food expert and chef). Their task was to create swoon-worthy recipes inspired by, and most closely resembling either the burger, cake, doughnut, pizza or spaghetti food Emoji, featuring a LANCEWOOD® product. Lucia Mthiyane was crowned the winner by judge, Zola Nene, the famous food goddess from Expresso Show, who put her stamp of approval on Lucia’s lip-smacking cheesecake – the perfect post braai delight. 2. Combine biscuit crumbs, sugar and butter; press firmly on bottom of 9-inch springform pan. 3. In a large bowl, beat eggs, castor sugar, lemon juice and cream cheese until fluffy. Gradually beat in condensed milk until smooth. 4. Pour the mixture into the springform pan over the biscuit mixture. 5. Bake at 160˚C for 50 to 55 minutes or until the centre is set. 7. Roll out the fondant and cover the cake. 8. Use white and yellow fondant to make three candles with flames. 9. Finish by placing fresh strawberries on top. The Challenge was inspired by the Emoji Meals offering on LANCEWOOD®’s Facebook page, which involved an interactive Bot enhancing viewers’ Ultimate Braai Master experience. By sending a food Emoji to LANCEWOOD®’s Facebook page via private message, the Bot instantly responds with a recipe or tip related to it. For example, sending a potato emoji would get you a recipe for LANCEWOOD’ Sour Cream baked potatoes – hot out of the oven or fresh off the coals – with LANCEWOOD® Jalapeño Chutney Dip & Top for added flavour. “We wanted to take our Emoji Meals offering to another level and hand-picked our favourite foodie influencers to cook up a storm. 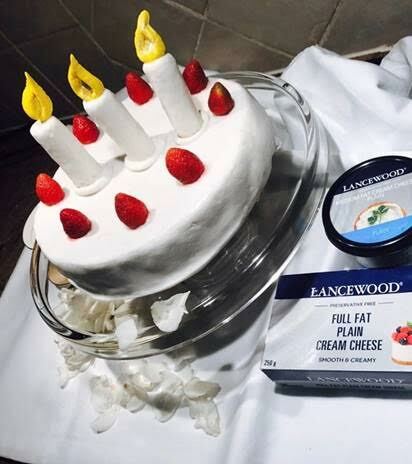 Ultimately, Lucia came out tops by whipping up a mouth-watering cheesecake that ticked all the boxes of a LANCEWOOD® culinary creation,” says Shereen Anderhold, Marketing Manager at LANCEWOOD®. Grease a cake tin and pour in the mixture. Bake at 180˚C for 30 to 40 minutes. Cook the patty until medium to well-done. Slice the bun open, trim the edges with a scissor to get the perfect round shape and place the patty on the bun. Quickly dip the slice of LANCEWOOD® cheese into a bowl of boiling water, before laying it on top of the burger patty. Close the bun to complete the burger. Heat oil in a pan and fry onions and garlic until they are soft. Add in your smoked chilli flakes and chutney. Add chopped tomatoes and the tomato paste to your mince. Allow to gently cook for 20 minutes. Once you have drained your pasta, place it in a dish of your choice and serve with bolognaise sauce. Grate cheese, and garnish accordingly. For more information, visit the Lancewood Cheese Facebook page.